The Kingdom of the Lombards (Latin: Regnum Langobardorum) also known as the Lombard Kingdom; later the Kingdom of (all) Italy (Latin: Regnum totius Italiae), was an early medieval state established by the Lombards, a Germanic-speaking people, on the Italian Peninsula in the latter part of the 6th century. The king was traditionally elected by the highest-ranking aristocrats, the dukes, as several attempts to establish a hereditary dynasty failed. The kingdom was subdivided into a varying number of duchies, ruled by semi-autonomous dukes, which were in turn subdivided into gastaldates at the municipal level. The capital of the kingdom and the center of its political life was Pavia in the modern northern Italian region of Lombardy. Over time, the Lombards gradually adopted Roman titles, names and traditions. By the time Paul the Deacon was writing in the late 8th century, the Lombardic language, dress and hairstyles had all disappeared. Initially the Lombards were Arianist Christians, at odds with the Papacy both religiously and politically. However, by the end of the 7th century, their conversion to Catholicism was all but complete. Nevertheless, their conflict with the Papacy continued, and was responsible for their gradual loss of power in the face of the Franks, who conquered the kingdom in 774. Charlemagne, the king of the Franks, adopted the title "King of the Lombards", although he never managed to gain control of Benevento, the southernmost Lombard duchy. A reduced Regnum Italiae, a heritage of the Lombards, continued to exist for centuries as one of the constituent kingdoms of the Holy Roman Empire, roughly corresponding to the territory of the former Langobardia Maior. The so-called Iron Crown of Lombardy, one of the oldest surviving royal insignia of Christendom, may have originated in Lombard Italy as early as the 7th century and continued to be used to crown Kings of Italy until Napoleon Bonaparte in the early 19th century. In the 6th century Byzantine Emperor Justinian attempted to reassert imperial authority in the territories of the Western Roman Empire. In the resulting Gothic War (535–554) waged against the Ostrogothic Kingdom, Byzantine hopes of an early and easy triumph evolved into a long war of attrition that resulted in mass dislocation of population and destruction of property, problems further exacerbated by widespread famine (538–542) and a devastating plague pandemic (541–542). Although the Byzantine Empire eventually prevailed, the triumph proved to be a pyrrhic victory, as these all factors caused the population of Italian Peninsula to crash, leaving the conquered territories severely underpopulated and impoverished. The Lombard arrival broke the political unity of the Italian Peninsula for the first time since the Roman conquest (between the 3rd and 2nd century BC). 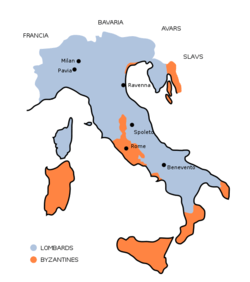 The peninsula was now torn between territories ruled by the Lombards and the Byzantines, with boundaries which changed over time. 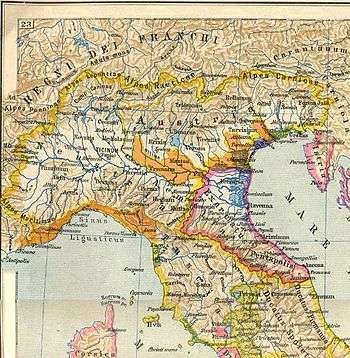 The newcoming Lombards were divided into two main areas in Italy: the Langobardia Maior, which comprised northern Italy gravitating around the capital of the Lombard kingdom, Ticinum (the modern-day city of Pavia in the Italian region of Lombardy); and Langobardia Minor, which included the Lombard duchies of Spoleto and Benevento in southern Italy. The territories which remained under Byzantine control were called "Romania" (today's Italian region of Romagna) in northeastern Italy and had its stronghold in the Exarchate of Ravenna. Lombard rule at the death of Alboin (572). Later in 572, the thirty-five dukes assembled in Pavia hailed king Cleph. The new monarch extended the boundaries of the kingdom, completing the conquest of Tuscia and laying siege to Ravenna. Cleph tried to consistently pursue the policy of Alboin, which aimed to break the legal-administrative institutions firmly established during Ostrogoth and Byzantine rule, by eliminating much of Latin aristocracy, occupying the lands and acquiring the assets. He too, however, in 574 fell victim of a regicide, slain by a man of his entourage, perhaps instigated by the Byzantines. Following Cleph's assassination another king was not appointed, and for a decade  dukes ruled as absolute monarchs in their duchies, not without internal struggles (Rule of the Dukes or of anarchy). At this stage, the occupation of the dukes was simply the heads of the various fare of the Lombard people; not yet firmly associated with the cities, they simply acted independently, also because they were under pressure of the warriors nominally under their authority to exploit the still largely possibility of loot. This unstable situation, which persisted over time, led to the final collapse of the Roman-Italic political-administrative structure, which was almost maintained up to the invasion, so that the same Roman-Italic aristocracy had retained responsibility for civil administration (as exemplified by the likes of Cassiodorus). In Italy the Lombards then imposed themselves at first as the dominant caste in place of the pre-existing one, deleted or thrown out. The products of the land were allocated to his Roman subjects that worked it, giving to the Lombards a third (tertia) of crops. The proceeds were not given to individuals but to the fare, which administered them in the halls (a term still used in the Italian toponymy). The economic system of late antiquity, which focused on large estates worked by peasants in semi-servile condition, was not revolutionized, but modified only to benefit the new rulers. After ten years of interregnum, the need for a strong centralized monarchy was clear even to the most independent of the dukes; Franks and Byzantines pressed and the Lombards could no longer afford a too fluid power structure, useful only to make forays in search of plunder. In 584 the dukes agreed to crown king Cleph's son, Autari, and delivered to the new monarch half of their property (and then probably getting even with a new crackdown against the surviving Roman property land). Autari was then able to engage in the reorganization of the Lombards and their settlement in stable form in Italy. He assumed, like the Ostrogoth Kings, the title of Flavio, with which he intended to proclaim himself also protector of all Romans on its territory: it was a clear call, with anti-Byzantine overtones, to the heritage of the Western Roman Empire. From the military point of view, Autari defeated both the Byzantines and Franks and broke the coalition, thereby fulfilling the mandate which the dukes themselves had entrusted him at the time of his election. In 585 he drove the Franks into modern Piedmont and led the Byzantines to ask, for the first time since the Lombards had entered Italy, for a truce. At the end, occupied the last Byzantine stronghold in northern Italy: Isola Comacina in Lake Como. To ensure a stable peace with the Franks, Autari attempted to marry a Frankish princess, but the project failed. Then the king, in a move that would influence the fate of the kingdom for more than a century, turned to the traditional enemies of the Franks, the Bavarii, to marry a princess, Theodelinda, which is more blood was Lethings (i.e. descended from Wacho, king of the Lombards between 510 and 540 and a figure surrounded by an aura of legend, a member of a royal line of great ascendency over the Lombards). Autari died in that same 590, probably due to poisoning in a palace plot and, according to the legend recorded by Paul the Deacon, the succession to the throne was decided in a novel fashion. 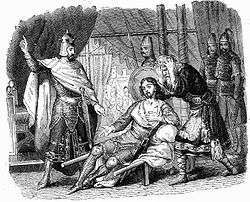 It was the young widowed Queen Theodelinda, a Bavarii of Lething descent, to choose the heir to the throne and her new husband: the Duke of Turin, Agilulf. The following year (591) Agilulf received the official investiture from the Assembly of the Lombards, held in Milan. The influence of the queen over Agilulf's policies was remarkable and major decisions are attributed to both. The Lombard Kingdom with its three main areas: Neustria, Austria and Tuscia. After a rebellion among some dukes in 594 was nipped in the bud, Agilulf and Theodelinda developed a policy of strengthening their hold of Italian territory, while securing their borders through peace treaties with France and the Avars. The truce with the Byzantines was systematically violated and the decade up to 603 was marked by a marked recovery of the Lombard advance. 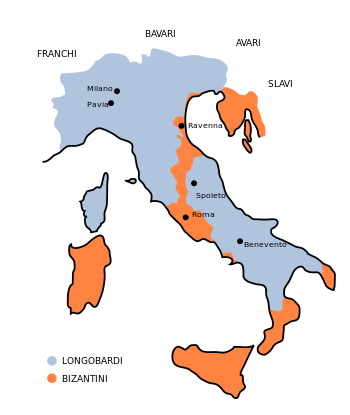 In northern Italy Agilulf occupied, among other cities, Parma, Piacenza, Padova, Monselice, Este, Cremona and Mantua, but also to the south the duchies of Spoleto and Benevento, extending the Lombards' domains. The strengthening of royal powers, started by Autari and continued by Agilulf, also marked the transition to a new concept based on stable territorial division of the kingdom into Duchies. Each duchy was led by a Duke, not just the head of a fara but also a royal official, depositary of public powers. The locations of the duchies were established in strategically important centers, thus further the development of many urban centers placed along the main communication routes of the time (Cividale del Friuli, Treviso, Trento, Turin, Verona, Bergamo, Brescia, Ivrea, Lucca). In the management of public power dukes were joined by minor officials, these the sculdahis and the gastald. 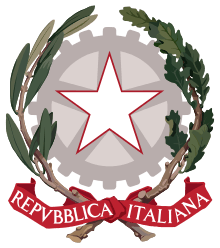 The new organization of power, less linked to race and Clan relations and more to land management, marked a milestone in the consolidation of the Lombard kingdom in Italy, which gradually lost the character of a pure military occupation and approached a more proper state model. The inclusion of the losers (the Romans) was an inevitable step, and Agilulf made some symbolic choices aimed at the same time in strengthening its power and to credit it with the people of Latin descent. The ceremony of association to the throne of her son Adaloald in 604, followed a Byzantine rite, chose as the capital no longer Pavia, but the ancient Roman city of Milan and Monza as a summer residence; identified himself, in a votive crown, Gratia Dei rex totius Italiae ("By the grace of God king of all Italy", and not just Langobardorum rex, "King of the Lombards"). Moves in this direction also the strong pressure, particularly from Theodelinda, of turning toward the conversion of the Lombards to Catholicism, until then still largely pagan or Arians. The rulers also endeavored to heal the Three Chapter schism (where the Patriarch of Aquileia had broken communion with Rome), maintained a direct relationship with Gregory the Great (preserved in correspondence between him and Theodelinda) and promote the establishment of monasteries, like the one founded by Saint Columbanus in Bobbio. The Lombard rule at the death of Rothari (652). After death of Agilulf, in 616, the throne passed to his son Adaloald, a minor. 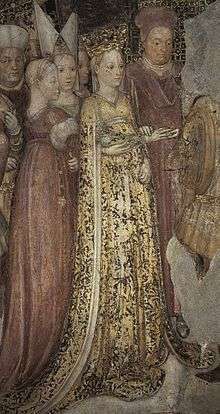 The regency (which in fact continued even after the release of King from minority) was exercised by the Queen Mother Theodelinda, who gave the military command to the Duke Sundarit. Theodelinda continued Agilulf's pro-Catholic policy and peace with the Byzantines, however, this caused an ever stronger opposition from the warrior and Arian component of the Lombards. Conflict broke out in 624 and was led by Arioald, Duke of Turin and Adaloald's brother in law (he married his sister Gundeperga). Adaloald was deposed in 625 and Arioald became king. The "coup d’etat" against the Bavarian dynasty of Adaloald and Theodelinda, which led Arioald to the throne, opened a season of conflict between the two religious components of the realm. Behind or beside the choice of faith, however, the conflict had political colourings, as it opposed the architects of a policy of peace with Byzantium and the Papacy and integration with the Romans to the proponents of a more aggressive and expansionist policy (Arian nobility). After the short reign of the son of Rothari, his son Rodoald (652-653), the dukes elected king Aripert I, Duke of Asti and grandson of Theodolinda. So returned to the throne the Bavarian dynasty, a sign of the dominance of the Catholic faction over the Arian one; the kingdom of Aripert was known for the heavy repression of Arianism. At his death (661) Aripert’s will divided the kingdom between his two sons, Perctarit and Godepert. The procedure was common among the Franks, but remained a unique case among the Lombards. Perhaps because the partition entered immediately into crisis: a conflict broke out between Perctarit, based in Milan, and Godepert, who remained in Pavia, which also involved the Duke of Benevento, Grimoald. The duke intervened with substantial military force to support Godepert, but as soon as he arrived in Pavia, he killed the king and took his place. Perctarit, clearly in inferiority, fled to the Avars. Grimoald obtained the investiture of the Lombard nobles, but still had to deal with the legitimate faction, which tied international alliances to bring the throne Perctarit. Grimoald obtained from the Avars and the return of the deposed ruler and Perctarit, as soon as he returned to Italy, had to make an act of submission to the usurper before he could escape to the Franks of Neustria, who in 663 attacked Grimoald. The new king, hated by Neustria because he was allied with the Franks of Austrasia, repelled them in Refrancore, near Asti, and remained on his throne. Grimoald, who in 663 had also defeated an attempt to reconquer Italy by the Byzantine Emperor Constans II, exercised his sovereign powers with a fullness never attained by his predecessors. At the fidelity of his Duchy of Benevento entrusted to his son Romuald, added that the duchies of Spoleto and Friuli, where he imposed dukes loyal to him. He favoured the integration of the different components of the kingdom, and presented his subjects with an image modeled on that of his predecessor Rotari, at the same time that of wise legislator (Grimoald added new laws to the Edict), patron (built in Pavia a church dedicated to Saint Ambrose) and valiant warrior. With Grimoald’s death, in 671, Perctarit returned from exile and ended the ephemeral realm of Garibald, the son of Grimoald and still a child. He immediately came to an agreement with Grimoald's other son, Romualdo I of Benevento, who pledged loyalty in exchange for recognition of the autonomy of his duchy. Perctarit developed a policy in line with the tradition of his dynasty and supported the Catholic Church against Arianism and members to Three-Chapter Controversy. He sought and achieved peace with the Byzantines, who acknowledged Lombard sovereignty over most of Italy, and repressed the rebellion of the Duke of Trent, Alahis, although at the cost of hard territorial concessions (the duke himself also obtained for the Duchy of Brescia). 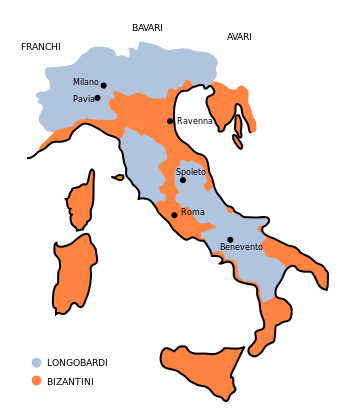 The crisis resulted from the divergence between the two regions of Langobardia Maior: on one side the western regions (Neustria), loyal to the Bavarian rulers, pro-Catholic and supporters of the policy of reconciliation with Rome and Byzantium; on the other side the eastern part (Austria), linked to the Lombard tradition that, after accession to paganism and Arianism, didn’t want to resign himself to a mitigation of the warlike character of their people. The branch of the dukes of Austria challenged the increasing "latinization" of customs, court practices, law and religion, which accelerated the disintegration and loss of Germanic identity of the Lombard people. The victory allowed Cuniperto, already long associated with the throne by his father and not a secondary actor of his policy, to continue the work of pacification of the kingdom, always with a pro-Catholic accent. A synod convened in Pavia in 698, sanctioned the reabsorption of the Three-Chapter Controversy, with the return of the schismatic to Roman obedience. Cunipert's death in 700, marked the opening of a dynastic crisis. The ascent to the throne of the minor son of Cunipert, Liutpert, was immediately challenged by the Duke of Turin, Raginpert, also leader of the Bavarian dynasty. Raginpert defeated in Novara the supporters of Liutpert (his tutor Ansprand, Duke of Asti, and the Duke of Bergamo, Rotarit) and the beginning of 701, succeeded to the throne. However, he died after just eight months, leaving the throne to his son Aripert II. Ansprand and Rotarit reacted immediately and imprisoned Aripert, returning the throne to Liutpert. Aripert, in turn, managed to escape and meet with the tutors of his antagonist. In 702 he defeated them in Pavia, imprisoned Liutpert and occupied the throne. Shortly after, he finally defeated the opposition: he killed Rotarit, suppressed his duchy and drowned Liutpert. Only Ansprand managed to escape, taking refuge in Bavaria. Subsequently, Aripert crushed a new rebellion, that of the Duke of Friuli, Corvulus, and was able to develop a policy of appeasement, always favouring the Catholic element in the kingdom. In 712 Ansprand returned to Italy with an army raised in Bavaria, and clashed with Aripert; the battle was uncertain, but the king gave proof of cowardice and was abandoned by his supporters. He died while trying to escape to the realm of the Franks, and drowned in the Ticino, where he sank due to the weight of gold that he brought with him . With him ended the presence of the Bavarian dynasty on the throne of the Lombards. Lombard's Domains at Liutprand’s death (744). Ansprand died after only three months of his reign, leaving the throne to his son Liutprand. His reign, the longest of all those Lombards in Italy, was characterized by the almost religious admiration that was accorded to the king by his people, who recognized in him boldness, courage and political vision; Thanks to these qualities Liutprand survived a two attempts on his life (one organized by one of his relatives, Rotari), and he displayed no inferior qualities in the conduct of the many wars of his long reign. These values are typical of Liutprand Germanic descent, king of a nation now overwhelmingly Catholic, joined by those of a ’’piissimus rex’’ (despite having tried several times to take control of Rome). On two occasions, in Sardinia and in the region of Arles (where he had been called by his ally Charles Martel) he successfully fought Saracen pirates, enhancing his reputation as a Christian king. His alliance with the Franks, crowned by a symbolic adoption of the young Pepin the Short, and with the Avars, on the eastern borders, allowed him to keep his hand relatively free in the Italian theater, but he soon came to a clash with the Byzantines and with the Papacy. A first attempt to take advantage of an Arab offensive against Constantinople, in 717, achieved few results; to draw closer to the papacy had therefore wait for the outbreak of tensions caused by the worsening of the Byzantine tax and the expedition in 724 conducted by the Exarch of Ravenna to destitute the rebel Pope Gregory II. Later on he exploited the disputes between the pope and Constantinople over iconoclasm (after the decree of Emperor Leo III the Isaurian of 726) to take possession of many cities of the Exarchate and of the Pentapolis, posing as the protector of Catholics. In order not to antagonize the Pope, he gave up the occupation of the village of Sutri; however, Liutprand gave back the city not to the emperor, but to "the apostles Peter and Paul", as Paul the Deacon related in his ‘’Historia Langobardorum’’. This donation, known as the Donation of Sutri, provided the legal precedent for attributing a temporal power to the papacy, which finally produced the Papal States. In the following years, Liutprand entered into an alliance with the Exarch against the pope, without giving up the old one with the Pope against the Exarch; he crowned this classic double play with an offensive that led to the duchies of Spoleto and Benevento under his authority, eventually arriving to negotiate a peace between the pope and Exarch beneficial for the Lombards. No Lombard king ever had obtained similar results in wars with other powers on the Italian territory. In 732 his nephew Hildeprand, who succeeded him on the throne, even briefly succeeded in taking possession of Ravenna, however he was driven away by the Venetians called shortly after the new pope, Gregory III. Liutprand was the last of the Lombard king to count on the unity of his kingdom; after him no king was able to eliminate the opposition and to reign supreme, and indeed many dukes’ defections and the constant betrayals would lead to the ultimate defeat. The strength of his power was based not only on personal charisma, but also on the reorganization of the kingdom which he had undertaken since the early years. He strengthened the chancellery of the royal palace of Pavia and defined in an organic way the territorial competencies (legal and administrative) of sculdasci, gastalds and dukes. He was also very active in the legislative field: the twelve volumes of laws enacted by him introduced legal reforms inspired by Roman law, improve the efficiency of the courts, changed the wergild and, above all, protected the weaker sectors of society (minors, women, debtors, slaves ). Already in the 7th century, the socio-economic structure of the kingdom had been progressively changing. Population growth led to fragmentation of funds, which increased the number of Lombards that fell below the poverty line, as evidenced by the laws aimed to alleviate their difficulties. By contrast, some Romans began to ascend the social ladder, becoming rich through commerce, crafts, the professions or the acquisition of lands that the Lombards had not been able to manage profitably. Liutprand intervened also in this process by reforming the administrative structure of the kingdom and freeing the poorest Lombards from military obligations. Hildeprand’s reign lasted only a few months, then was overthrown by a rebellion led by Duke Ratchis. The details of the episode are not clear, since the crucial testimony of Paul Deacon ended with a eulogy on the death of Liutprand. Hildeprand had been anointed king in 737, during a serious illness Liutprand (who did not like at all: "Non aequo animo accepit" wrote Paul Deacon ), although, once recovered, he accepted the choice. The new king, then, at least initially enjoyed the support of most of the aristocracy, if not that of the great monarch. Ratchis, the Duke of Friuli who took the throne in his place, came from a family with a long tradition of rebellion against the monarchy and rivalry with the royal family, but on the other hand, he owed his life and the ducal title to Liutprand, who had forgiven him after discovering a conspiracy headed by his father, Pemmo of Friuli. Ratchis was a weak ruler: on one side he had to concede greater freedom of action to the other dukes, on the other extreme he had to take care not to exacerbate the Franks and, above all, the mayor of the palace and de facto king Pepin the Short, the adopted son of the king that had dethroned his nephew. Not being able to trust the traditional structures of support for the Lombard monarchy, he sought support among the gasindii, namely the gentry bound to the king by treaties of protection  and especially among the Romans, the non-Lombard subjects. These innovations of ancient costumes, along with public pro-Latin attitudes (he married a Roman woman, Tassia, and with Roman rite; adopted the title of princeps instead of the traditional ‘’rex Langobardorum’’) increasingly alienated the Lombard base which forced him to seek a total change of heart, with a sudden attack to the cities of the Pentapolis. The pope, however, convinced him to abandon the siege of Perugia. After this failure the prestige of Ratchis collapsed and the dukes elected as the new king his brother Aistulf, who had already succeeded him as duke in Cividale and now, after a short struggle, forced him to flee to Rome and finally to become a monk in Monte Cassino. Aistulf was the political expression of the more aggressive stance of the dukes, who refused an active component of the Roman population. For his expansionist policy, however, he had to reorganize the army to include, albeit in a subordinate position of light infantry, all ethnic groups in the kingdom. To be subject to military obligations were all free men of the kingdom, both those of Roman and Lombard origin; the military standards promulgated by Aistulf mention several times the merchants, a sign of how the class had now become relevant. Lombards domains after the conquests of Aistulf (751). Initially Aistulf achieved some notable successes, culminating in the conquest of Ravenna (751); here the king, residing in the Palace of the Exarch and coining money in Byzantine style, presented his program: to collect under its power all the Romans until then subject to the emperor, without necessarily merging them with the Lombards. The Exarchate was not homologous to other Lombard possessions in Italy (that is it was not converted into a Duchy), but retained its specificity as sedes imperii: this way Aistulf proclaimed himself heir, in the eyes of Italian Romans, of the Byzantine Emperor and of the Exarch, his representative. Just when it seemed Aistulf was now up and running to defeat all opposition on Italian soil, in Gaul Pepin the Short, the old enemy of the usurpers of Liutprand's family, finally managed to overthrow the Merovingian dynasty, deposing Childeric III and becoming king also de jure. The support of the papacy was decisive, although negotiations were also underway between Aistulf and the pope (which soon failed), and an attempt was made to weaken Pepin by lobbying against him his brother Carloman. Because of the threat that this move was for the new king of the Franks, an agreement between Pepin and Stephen II settled, in exchange for the formal royal anointing, the descent of the Franks in Italy. In 754 the Lombard army, deployed in defence of the Locks in Val di Susa, was defeated by the Franks. Aistulf, perched in Pavia, had to accept a treaty that required the delivery of hostages and territorial concessions, but two years later resumed the war against the pope, who in turn called on the Franks. Defeated again, Aistulf had to accept much harsher conditions: Ravenna was returned not to the Byzantines, but to the pope, increasing the core area of the Patrimony of St. Peter; Aistulf had to accept a sort of Frankish protectorate, the loss of territorial continuity of his domains and payment of substantial compensation. The duchies of Spoleto and Benevento were quick to ally themselves with the victors. Aistulf died shortly after this severe humiliation, in 756. Aistulf's brother Ratchis left the monastery and attempted, initially with some success, to return to the throne. He opposed Desiderius, who was put in charge of the Duchy of Tuscia by Aistulf and based in Lucca; he did not belong to the dynasty of Friuli, frowned upon by the pope and the Franks, and managed to get their support. The Lombards surrendered to him to avoid another descent of the Franks and Rachis was persuaded by the Pope to return to Monte Cassino. Desiderius with a clever and discreet policy gradually reasserted Lombard control over the territory by leveraging on the Romans again, creating a network of monasteries ruled by Lombard aristocrats (his daughter Anselperga was created abbess of San Salvatore in Brescia), dealing with Pope Stephen II's successor, pope Paul I, and recognizing the nominal domain on many areas truly in his power, such as reclaimed southern duchies. He also implemented a casual marriage policy, marrying his daughter Liutperga to the Duke of Bavaria, Tassilo (763), historical adversary of the Franks and, at the death of Pepin the Short, by marrying the other daughter Desiderata (who was immortalised in the tragedy Adelchi by Alessandro Manzoni as Ermengarde) to the future Charlemagne, offering him a useful support in the fight against his brother Carloman. Just when, in 771, Desiderius was about to reap the fruits of his skillful policy by managing to convince the new pope, Stephen II, to accept his protection, the death of Carloman left freehanded Charlemagne, now firmly on the throne, which repudiated the daughter of Desiderius. The following year a new pope, Adrian I, of the opposite party of Desiderius, reversed the delicate game of alliances, demanding the surrender of the area never ceded by Desiderius and thus bring him to resume the war against the cities of Romagna. Charlemagne, though he had just begun his campaign against the Saxons, came to the aid of the pope, fearing the capture of Rome by the Lombards and the consequent loss of prestige. Between 773 and 774 he invaded Italy - once again the defence of the Locks was ineffective, the fault on the divisions among the Lombards - and, having prevailed against a tough resistance, captured the capital of the kingdom, Pavia. The son of Desiderius, Adalgis, found refuge with the Byzantines. Desiderius and his wife were deported in Gaul. Charles then called himself Gratia Dei rex Francorum et Langobardorum ( "By the grace of God king of the Franks and the Lombards"), realizing a personal union of the two kingdoms; he maintained the Leges Langobardorum, but reorganized the kingdom on the Frankish model, with counts in place of dukes. Thus ended Lombard Italy, and nobody can say whether it was, for our country, a fortune or a misfortune. Alboin and his successors were awkward masters, more awkward than Theodoric, until they had been barbarians camped on a conquest territory. But now they were assimilating with Italy and could turn it into a Nation, as the Franks were doing in France. But in France there wasn't the Pope. In Italy, there was. — Alessandro Manzoni, Adelchi, Choir Third Act. Sergio Rovagnati defines the continuing negative prejudice against the Lombards "a sort of damnatio memoriae", common to that given often to all the protagonists of the barbarian invasions. 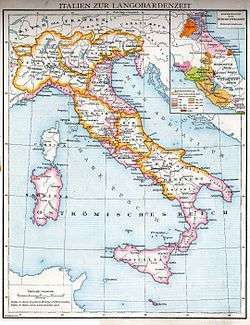 The most recent historiographical guidelines, however, have largely reassessed the lombard era of the history of Italy. The German historian Jörg Jarnut pointed out all the elements that constitute the historical importance of the Lombard kingdom. The persistent injury historiography on the "dark ages" has long cast shadows on the Lombard kingdom, averting the interest of writers from that period. 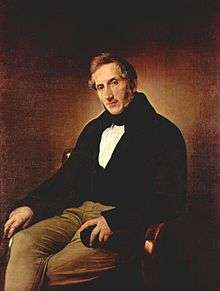 Few literary works have so been set in Italy between the 6th and 8th centuries; between them, relevant exceptions are those of Giulio Cesare Croce and Alessandro Manzoni. More recently the Friulian writer Marco Salvador has devoted a trilogy fiction to the Lombard kingdom. The figure of Bertoldo/Berthold, a humble and clever farmer from Retorbido, who lived during the reign of Alboin (568-572), inspired many oral traditions throughout the Middle Ages and early modern period. In them found inspiration the 17th scholar Giulio Cesare Croce in his Le sottilissime astutie di Bertoldo ("the smart craftiness of Berthold") (1606), which in 1608 added the following Le piacevoli et ridicolose simplicità di Bertoldino ("The pleasant and ridiculous simplicity of Little Berthold"), about son of Berthold. ↑ In this regard, it is worth mentioning the partition Pepin the Short didvided his kingdom between his two sons Carloman and Charles (future Charlemagne), and the division prepared by Charlemagne himself in favour of the three heirs.